The proposed site of the base of operations (BOO) for the IFE14 inspection team was visited by an advance party of inspectors as part of the point of entry procedures. The purpose of the visit was to establish the coordinates of the proposed site, and assess its suitability for use, including an assessment of health and safety risks. All was well. Background radiation levels were well within safe limits. 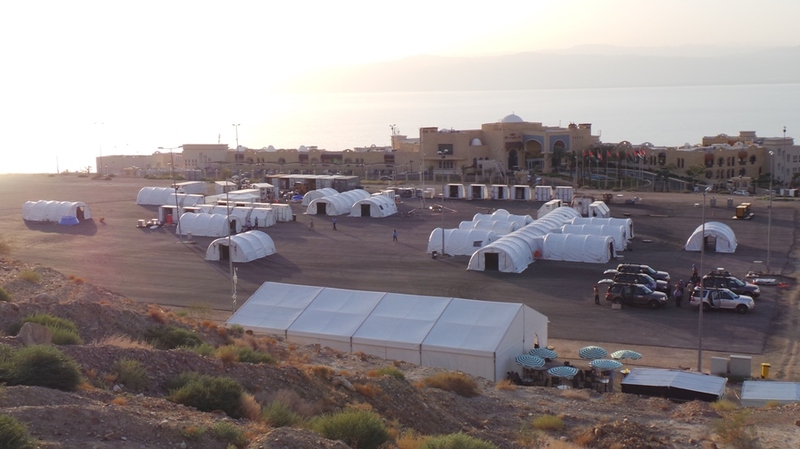 The logistical and security arrangements for the site are well suited. One issue did arise, however. 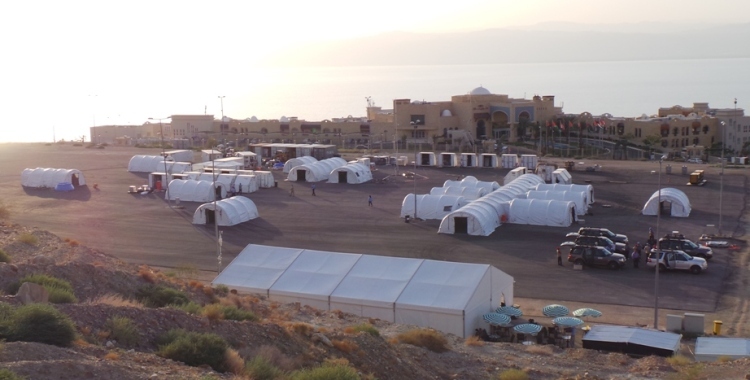 The inspection team’s working tents need to be secured to the ground, and it was clear that in the ground were buried cables and pipes associated with the overhead lighting and the water system. If an inspector drilling a hole or driving a spike into the ground struck and damaged an electrical cable the result could be very serious. The issue was raised with the inspected state party, together with a proposed solution. It was agreed that geophysical equipment, which would not normally be released for use until much later in the inspection time line, could be unpacked and used by the inspection team to detect and map the pipes and cables in the ground. 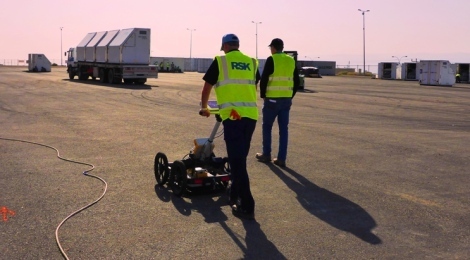 The equipment is the same ground penetrating radar technology used commercially across the work for mapping buried infrastructure and archaeology, work that some inspectors do as their ‘day job’ away from the CTBTO. 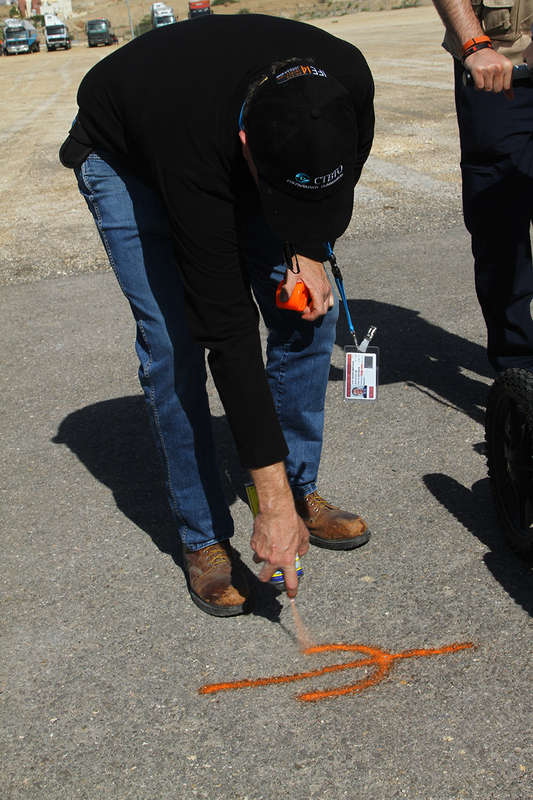 Detected subsurface hazards were marked out on the ground, and an exclusion zone of 1 meter was established either side of the paint marks. There was no option in the layout to avoid placing tents over the route of electrical cables in the ground, however, having them clearly marked out allowed the inspectors to avoid drilling close to any of the buried cables. While IFE14 is a simulated exercise, this reminds us that what the inspectors are doing is real. This was a genuine health and safety concern, solved by the careful application of inspection equipment to detect and map buried features.